The new Unilux LED-1. Easy to use & technically excellent. A compact inspection light which is small enough to fit in your pocket, yet powerful enough to see the smallest details with its strong light output. 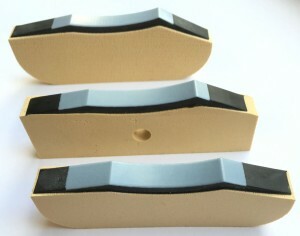 Perfect for spot checking tin plating, steel coating, packaging, film, printing paper and much more. Our useful LED-1 can also be used for maintenance on machinery such as chains, pulleys, gears and shafts. Boasts the brightest inspection light of its size. 433 LUX at 300 mm (12 in) distance from the object. Pinpoint perfect for spot checking. Extremely portable – battery powered and fits in your pocket. A weight of only 0.3 kg (0.65 lbs). Recharges fully in just 4 hours. Available in both Standard and UV models. Features an adjustable light intensity and speed to ensure it syncs perfectly with your machine or line. We use Long-life LEDs to ensure the LED-1 has a maintenance free life. 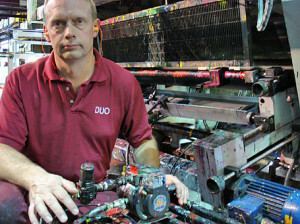 The inspection of printing, converting, paper and textile manufacturing. Inspecting belts, chains, gears, pulleys, and webs for factory and plant maintenance. Can accurately monitor the linear motion of packages and bottles, as well as press registration. Ideal for use in textile mills for inspecting the quality of spinners. Features a quality tachometer for motor speeds. The new Unilux LED-3 is lighter, brighter and more flexible – yet still just as affordable. 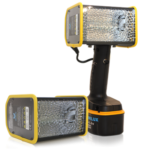 Twice as powerful and more compact than its predecessor, the LED-3 makes for a fantastic tool for narrow inspection. 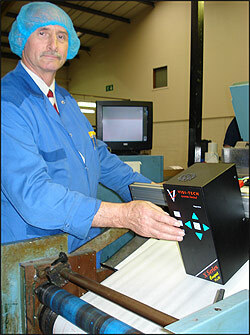 Easily ensure the quality of your print, registration and slit. Perfect for maintaining and troubleshooting your machinery issues, the LED3 is also available in spot, flood and UV options. Flood: 2660 LUX at 300 mm (12 inches) distance from the object. Spot: 4990 LUX at 300 mm (12 inches) distance from the object. UV: 715 uW/CM2 at 300 mm (12 inches) distance from the object. Boasts an incredibly bright and uniform illumination. Comes in both handheld or fixed mount versions. Available as flood, spot and UV models. Has a variable flash rate and duration that syncs with your line or machine. Features a constant-on for work light. Very light, weighing only 1.1 kg (2.4 lbs). Can be used continuously for up to 4 hours. Can be fully recharged completely in 4 hours. Ability to interconnect multiple units. We use long-life LEDs to ensure the LED-3 is virtually maintenance free. Constructed from extremely durable and high quality materials. Narrow web printing, specifically quality inspection, checking registration, speed measurement, machine vision, confirming form alignment and inspecting security print elements using UV-visible inks. Narrow web converting, specifically the analysis of trimmed edge and perforation, inspecting the surface of standard and UV-visible adhesives and coatings, confirming the content and placement of labels and packaging plus the inspection of cold seal quality. Maintaining the detection of slippage in belts & webs, high-speed motion timing, measurement of motor speed and the vital work of troubleshooting shafts, gears and pulleys. Inspection tasks in textile mills and tin mills. The Unilux LED-9 is the brightest in its class. As an inspection light, the LED-9 stands above any light of its size with its brighter and more concentrated beam. The LED-9’s flash frequency is easily adjusted to match any line speed, allowing you to diagnose the smallest flaw. Also available in fixed mount and handheld models, with spot and flood options. Flood: 1430 LUX at 600 mm (24 inches) distance from the object. Spot: 3120 LUX at 600 mm (24 inches) distance from the object. Boasts the brightest and most concentrated uniform illumination. Available in both handheld or fixed-mount options. Choose from flood and spot options. Features an adjustable flash rate and duration that syncs perfectly with your line or machine. Includes a constant-on for work light. Lightweight construction –weighs only 1.1 kg (2.4 lbs). Can be used for up to 4 hours continuously. Can be fully charged up in just 30 minutes. A compact and lightweight construction. The facility to interconnect multiple units. A rotary encoder to facilitate greater precision. The use of long-life LEDs make the LED-9 a virtually maintenance-free product. Boasts a high quality and ultra-durable construction. Efficient design ensures energy consumption is reduced. 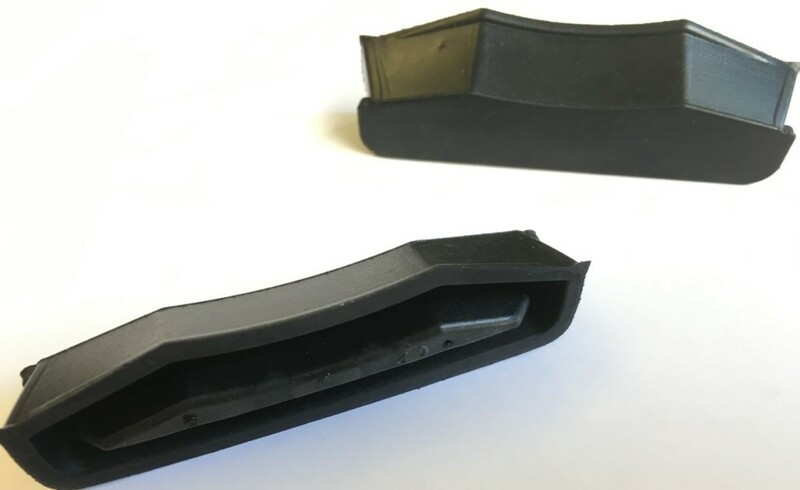 High-speed printing applications, including the inspection of registration and print quality, measurement of speed, machine vision and the confirmation of form alignment. Converting applications, including the analysis of trimmed edges and perforation and the surface inspection of coatings and adhesives. Operation in textile and tin mills. The Unilux LED-12. More accurate inspection from further away. 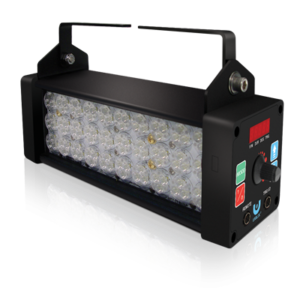 With twice the light output, the LED-12 can project light much further than many strobes as well as offering environmental and low maintenance benefits. 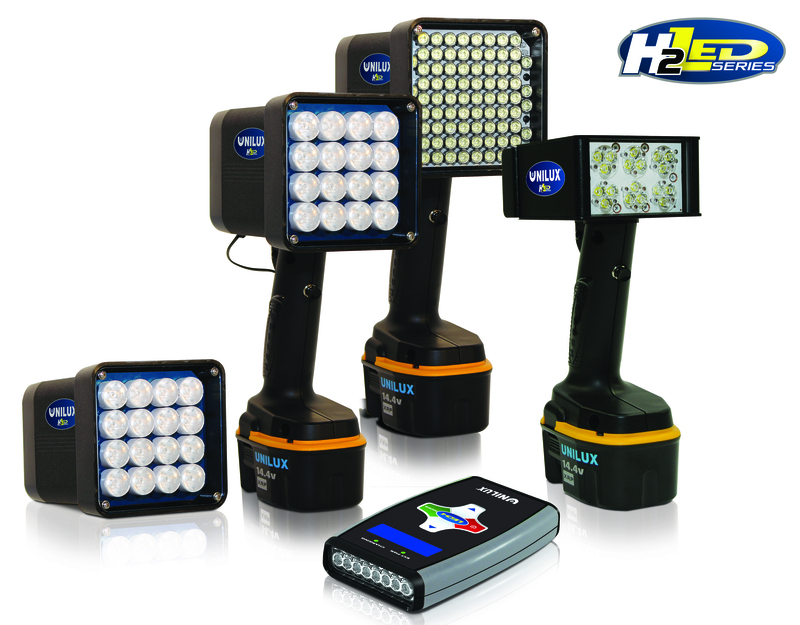 The LED-12 also comes in fixed and portable mount models with UV and flood options. Flood: 1430 LUX at 600 mm (24 inches) away from the object. Spot: 3120 LUX at 600 mm (24 in) away from the object. Brightest, most concentrated, uniform illumination. Availabe as a handheld or fixed mount model. Options of either flood or UV. The flash rate and duration are adjustable to sync with your line or machine. Lightweight construction, weighing only 0.8 kg (1.8 lbs). Can be used for up to 1 hour continuously. Fully chargeable in 4 hours. The product features long-life LEDs, helpingmake the LED-12 virtually maintenance free. Sturdy, quality construction; extremely durable. Printing and converting applications, including the inspection of print quality (for flood and UV-visible inks), both print-to-die and die-to-die registration, slit edge checking and the quality of laminating and coating jobs. Paper related applications including the inspection of spray nozzles, formation and transfer, troubleshooting machinery and diagnostic checks. Metals related inspection jobs, including surface inspection on galvanising lines, inspection lines, recoil lines, tension levelling and tin. Textile industry applications such as spinner analysis. Plant and machinery maintenance including detecting slippage in belts and webs, high speed motion timing, vibration analysis, measuring motor speed and the maintenance of shafts, gears, pulleys and bearings. 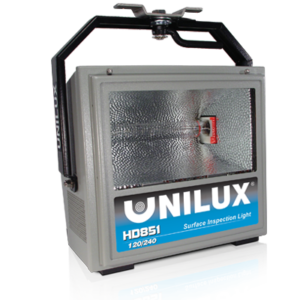 The Unilux Lith-O-Light 5. Tough yet lightweight. This powerful light supplies bright, sharp, even illumination and is incredibly easy to use. It can be used for spot checking with the handheld unit or for continuous inspection with the fixed mount unit on an articulating arm. This strobe’s rugged design holds up in all types of operations. 750 LUX light output at 300 mm (12 inches) away from the target. Features flash ranges of 6000 f/m or 12,000 f/m. Boasts a high intensity flood beam. Intensity adjustable from 35% to 100%. Available to buy in both handheld and fixed mount models. Features a completely adjustable flash rate and brightness. Comes with a remote control for those difficult to reach applications. A small, rugged and lightweight build. A range of printing and converting applications that include print quality inspection, both print-to-die and die-to-die registration, slit edge, laminating and coating quality inspection. Metals applications including surface inspection on galvanizing lines, tin mills and in-line inspection jobs. Jobs for textile mills including spinner analysis. Maintenance tasks including the detection of slippage in belts & webs, high speed motion timing, measurement of motor speed , the inspection of shafts, gears, pulleys and bearings and vibration analysis. 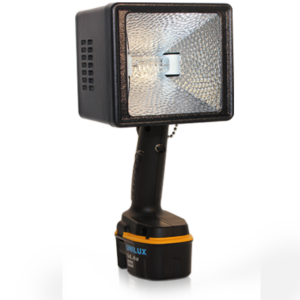 The Miti-Lite illuminates a larger area of any of the portable strobes currently on the market. This means that checking for surface quality, formation activity, coating defects, or identifying the origins of defects can be carried out anywhere along the line. The unit ensures spotting problems and fixing them is really easy as it is capable of lighting up an area of 760 mm square. 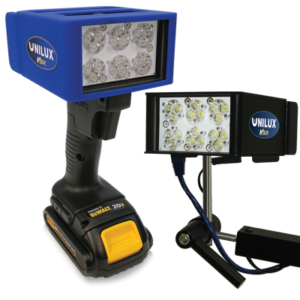 The Unilux Miti-Lite also synchronises simply and quickly with any video camera to ensure a motion inspection tool that reduces maintenance costs and time by ninety percent. 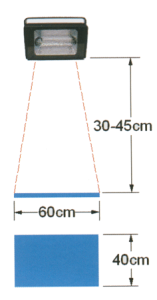 Can illuminate a surface area of 760 mm by 760 mm. Features three different intensity settings for extra control. The unit’s flash ranges cover 6,000, 12,000 & 18,000 feet per second. Includes phase control to facilitate camera synchronisation. Battery replacement is quick and easy to reduce downtime. This compact unit can easily monitor the finer surface quality details. Enables quick and accurate identification of defect origins. Ability to monitor start-up procedures once shutdown has completed. Portability means you can carry out inspection anywhere in paper and steel operations. Use the unit to effectively monitor mechanical function performance. Decrease diagnostic maintenance by ninety percent, reducing downtime and its associated costs. 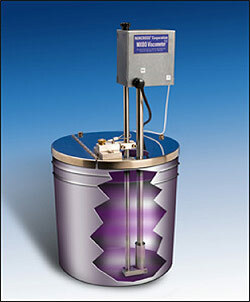 The Miti-Lite is a tough, quality unit, ideally suited for the harsh environments of steel and paper mills. Comes with a sling pouch you guarantee hands-free manoeuvrability anywhere. The accurate surface inspection on metal galvanising lines, tin mills, TL and recoil lines. Handling paper, specifically analysis of formation, transfer as well as drying and finishing processes. In printing and converting applications, inspect print quality, slit edge quality, laminating and coating quality to a high standard. The LED-250 is an ideal mix of technology, design and cutting edge features, making stroboscopic surface and print inspection yet more effective. The strobe is the perfect replacement for xenon lights, doing away with ozone and bulb replacement, meaning less energy usage and maintenance costs. At a distance of one metre (39 inches) from the target, the Unilux LED-250 spans an area of 400 x 300 mm (16 x 12 inches), whilst generating 1070 LUX of light output. A bright, highly concentrated and uniform illumination. Reduced glare on reflective surfaces. Uses an adjustable flash rate and the duration syncs perfectly with your line or machine. Features remote operation and trigger inputs to ensure instant synchronization. The LED-250 can handle many types of external synchronization signals. There is an option to interconnect multiple units, for extra flexibility. Uses a rotary encoder for increased precision. Features long-life LEDs to make the product practically maintenance free. Built with tough, high quality components and materials. Designed to consume less energy. The slim profile makes it easy to install whilst offering extra mounting options. The accurate inspection of print quality and print-to-die registration. Analysis of cut quality on the slitter/rewinder when converting. Ideal for coating and laminating applications, including surface inspection of adhesive and coating coverage. The inspection of surface on galvanising lines as well as tin plate. 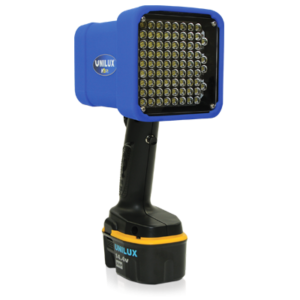 The Unilux LED-500 is the ultimate strobe light for medium web inspection. Its ultra-bright LEDs ensure detection of the smallest defects on webs of up to 600mm in width. Roller marks, bubbles, inclusions, scarring, and scratches cant escape its glare. 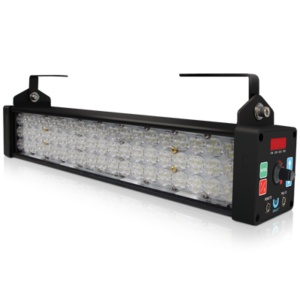 The strobe replaces xenon lights, which means you can do away with ozone and bulb replacement, and you can enjoy the resultant reduction in energy consumption and maintenance. At one meter (39 inches) away from the target, the LED-500 spans an area of 900 x 600 mm (35 x 23 inches) and provides 2210 LUX of light output. Generates 2210 LUX at one meter (39 inches) distance from the target. Provides the brightest, highly concentrated and even illumination. Significantly reduces glare on very reflective surfaces. Choose from Flood and UV models. Features a highly adjustable flash rate, whilst the duration syncs accurately with your line or machine. Models come supplied with remote operation and trigger inputs to facilitate instant synchronization. 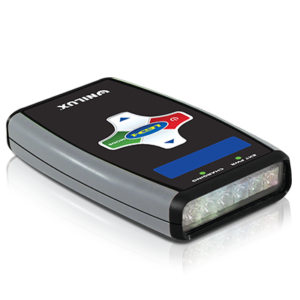 The LED-500 can accept a range of external synchronisation signals. Provides the ability to interconnect multiple units for extra flexibility. Features a rotary encoder to improve inspection precision. The long-life LEDs we use ensure that both the Unilux LED-500 & LED-500UV operate virtually maintenance-free. Boasts a high quality construction and extreme durability. Clever design means energy consumption and maintenance is reduced. The slimness of the unit makes for easier installation and extra mounting options. Accurate inspection of quality and print-to-die and die-to-die registration in printing applications. Superb analysis of cut quality on the slitter/rewinder in converting applications. When coating and laminating, the unit gives excellent surface inspection of adhesive and coating coverage. Improved surface inspection of metal galvanising lines and tin plate inspection. Ultra Violet applications such as the inspection financial documents, bank card foils, currency, passports, prescription pads, anti-tampering devices anything with a UV coating. This Unilux range grants powerful analysis across the entire width of the web. 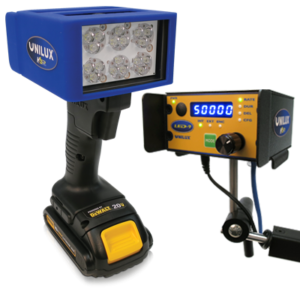 The Unilux LED-1000, LED-1500, LED-2000 and LED-2500 strobes are the ideal solution for for wide width inspection. A metre away from the target, these lights will illuminate from 1.4 metres to 2.9 metres, showing you the entire web simultaneously. For yet broader widths, the user can connect multiple units together. Spotting even the smallest defects quickly is easy, owing to the units’ extremely bright LED bulbs, in turn making outmoded xenon lights defunct and reducing energy consumption and maintenance. In ultra-violet applications, light output is 638uW/cm2 at 600mm (24inches) from the target. This ensures coverage of web widths from 1650mm (65inches) to 3600 mm (142 inches). Ultra-bright, highly concentrated and uniform illumination. Features a softer light beam for dealing with very reflective surfaces. Units are available as flood and UV models. Feature an adjustable flash rate with a duration that synchronises with your line or machine. Include remote operation & trigger inputs for immediate synchronisation. These units accept a wide range of external synchronisation signals. 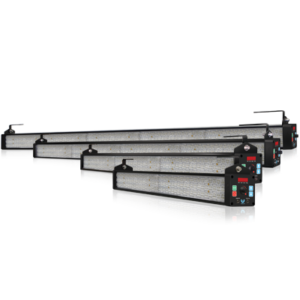 Featuring the facility to daisy-chain multiple units for extra-wide line widths. All feature rotary encoders for greater inspection precision. As with most Unilux products, these units feature constant-on for work light. The use of long-life LEDs ensure these wide web strobe lights operate virtually maintenance free. Constructed from high-quality and durable materials, as you’d expect from Unilux. Energy consumption is reduced considerably. Designed to be slim units, giving easy installation and additional mounting options. A range of printing inspection applications including package printing and rewinding. Converting including lamination and coating, slitting, rewinding, and metalising. Working with metals e.g galvanising lines, aluminium inspection, coating and paint lines, electric steel, blanking lines and bridle rolls. Working with paper; speciality paper and calendar inspection, slitting and rewinding. Ultraviolet inspection, for instance, financial documents, bank card foils, currency, ballots, passports, lottery tickets, prescription pads, anti-tampering devices and UV coatings. The Guardian’s intense, focused light makes it the choice for rewinder operators worldwide. The even illumination and short pulse duration allows operators to spot flaws, misprints, colour variations and/or voids at full speed on webs up to 60cm (24”). By synchronizing to various signals, the operator can be hands-free. As jobs and surface reflection change, the intensity settings can be personalized according to preference. With a 3 :1 lamp life over its competition, it outshines, outlasts and outperforms any other light in its class. The all new LOL-Style-IV combines the benefits of six different LOL-Style-III models into one. We doubled the power output making it 50% brighter than any other unit in its class. Not only does it provide the brightest light, it also provides the most even illumination of your entire web up to 1.2 meters wide, without hotspots, for fine detailed inspection. With the enhanced features and hands-free auto tracking, there is no other light that comes close to its performance. Pulse source: +2.5V PK min, zero based pulse, 100 µsec min. The all new LOL Style IV combines the benefits of six different LOL Style III models into one. We doubled the power output making it 50% brighter than any other unit in its class. Not only does it provide the brightest light, it also provides the most even illumination of your entire web up to 1.8 meters wide, without hotspots, for fine detailed inspection. The Unilux HD-851. Complete coverage on high-speed lines. A high power surface inspection light, the HD-851 is designed for use on continuous high-speed production lines. The design of this powerful industrial inspection strobe gives specific emphasis on reducing equipment maintenance. It can operate from a range of controllers or external triggering signals e.g. video, pulse or current. The user can synchronise multiple units to give maximum coverage. The unit outputs light measured at 3200 LUX at 1250mm (a distance of four feet). Projects an even and highly intense beam. Offers line speed synchronisation and adjustable light intensity. The snap-in lamp unit needs no tools when adding. Features motorised focus adjustment to accurately fit strip width. Multiple units can be synced using interconnecting cables. Includes an option for proportional line speed. The HD-851 has a rotary encoder for automatic web synchronisation. Standard remote controls for power, intensity, flash rate and internal / external triggering functionality. Deluxe remote controls facilitate all of the functions and automatic tracking with pre-set storage. Features a press-to-test switch for system checking. Another heavy duty and durable Unilux construction. Surface inspection of metals on hot and cold mills and continuous process lines. Broad web inspection of print quality. Converting analysis including wide web inspection on coaters and laminators, and cut quality on slitters/rewinders.